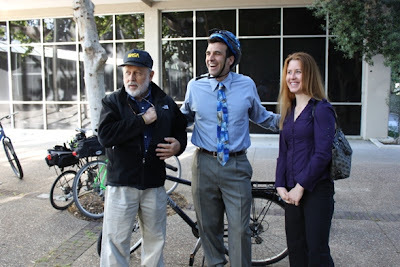 The San Jose Blog: Today is Bike-to-Work Day! If you see a lot of bikes on the road today, this is the reason why. Think of it as a city-wide bike party! San Jose, CA (May 3, 2011) – Today’s Clean Commute Challenge, a friendly competition between three modes of commuting from downtown San Jose’s The 88 condo-highrise, surprised a lot of people but not the bike-equipped commuters as the two-wheeled team beat both a light rail team and a car team for a classic two-mile commute. Participants included City Councilmen Sam Liccardo and Ash Kalra; Carl Guardino, Pres. and CEO of the Silicon Valley Leadership Group; and volunteer San Jose residents who regularly commute in the area. Starting at The 88 at roughly 7:45am, the three teams took best-recommended routes from Google Maps, 511.org or their own experience to draw attention to the ease and even the advantages of transit commuting. At the finish – the County Administration Building at 70 W. Hedding, where Liccardo and Kalra often go to meetings – the lead bike team took only 6 minutes, the lead car team took 12 minutes and the light-rail team took 17 minutes – with a caveat that the light-rail rider would have clocked 4 minutes less if he’d been able to take the planned train at 7:38 if the Challenge had started on time. "As leaders, we have to pedal what we preach," said Guardino. "For me, today's 'Clean Commute Challenge' is part of my everyday transportation experience, as my daily 32-mile roundtrip between Los Gatos and San Jose is on two wheels rather than four. It's healthy, fun and almost as time-efficient as the automobile during commute times." The Bike Coalition cites national research that adults who bike to work have better weight, blood pressure, and insulin levels, and that women who bike 30 minutes a day have a lower risk of breast cancer. The Commuter Challenge also highlights the progress made by San Jose, a League of American Bicyclists’ “Bike Friendly City,” as it takes advantage of its ideal climate and flat topography to promote cycling as a way to reduce traffic and pollution. “San Jose is moving in the right direction, between its ambitious bicycle plan approval last year and the opening of close-in housing like The 88, commuters really do have many more opportunities to choose their bikes to get to work and school year-round,” said Winter. · Almost 40 percent of Bay Area commuters live within just five miles of their workplace, a bike-able distance for even inexperienced cyclists. · If every person living this close to their workplace ditched their cars on Bike to Work Day alone, more than 60,000 vehicles would be off the road, reducing tailpipe emissions by more than 150,000 pounds. · Adults who bike to work have better weight, blood pressure, and insulin levels. · Women who bike 30 minutes a day have a lower risk of breast cancer. · Adolescents who bicycle are 48% less likely to be overweight as adults. · Thursday, May 12 is Bike to Work Day 2011 (BTWD) in the San Francisco Bay Area. · Each year, tens of thousands of commuters participate in BTWD. · In Santa Clara County, Silicon Valley Bicycle Coalition has organized almost 70 Energizer Stations where cyclists can stop and refresh on their way to work. · The large turnout each year makes such a visible presence of bicyclists that motorists actually take notice, slow down, and make room. PHOTO: San Jose Councilman Sam Liccardo, flanked by rail-commuter Tom Rivell and car-commuter Sarah Ligda, won a close ‘race’ in a Clean Commute Challenge today (May 3) from The 88 condo-highrise downtown to the County Administration building, drawing attention to May 12 Bike-to-Work Day.